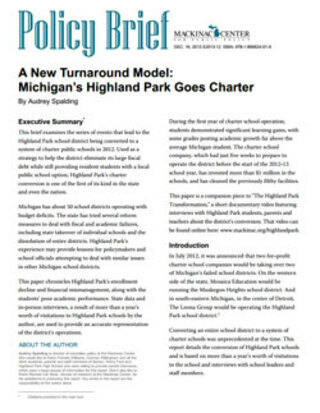 This brief examines the series of events that led to the Highland Park school district being converted to a system of charter public schools in 2012. Used as a strategy to help the district eliminate its large fiscal debt while still providing resident students with a local public school option, Highland Park's charter conversion is one of the first of its kind in the state and even the nation. During the first year of charter school operation, students demonstrated significant learning gains, with some grades posting academic growth far above the average Michigan student.